One of my offline projects has been a book on private prisons I've been writing with my friend and colleague Donna Selman. I'm pleased to say the book is now out and available: Punishment for Sale: Private Prisons, Big Business and the Incarceration Binge (Rowman and Littlefield, 2010). Those who have been reading the blog, my websites or other books will not be surprised that the book is critical of the impact for-profit, Wall Street traded, multi-billion dollar international prison business have had on justice and public safety.The book is relatively short (240 pages) and cheap (about $25 new). At the end are some links to more information, but this is a Box explaining the book. It comes from the forthcoming third edition of Class, Race, Gender & Crime, which I just finished copyediting (that book will be available over the summer). Yes this is either cross-promotion or shameless self-promotion, depending how you look at it. Chapter 2 [of Class, Race, Gender & Crime, 3rd ed] identified privatization as one of the major trends that would continue to exert an influence on the criminal justice enterprise. Privatization refers to the practice of outsourcing government functions and services to private, for-profit business under a contract with the government. Punishment and incarceration may seem like odd functions to privatize, but private prisons are a multi-billion dollar a year business and the two largest firms – Corrections Corporation of America (CCA) and GEO Group – are multinational businesses that are traded on Wall Street. In a recent groundbreaking examination of prison privatization, criminologists Donna Selman and Paul Leighton argue in Punishment for Sale (2010) that understanding the nature of the contemporary criminal justice system requires understanding privatization, including the business model and financial dynamics of these firms. It’s not just a multi-billion dollar business, but CCA has a billion dollar credit line with various powerful Wall Street investment banks. They – and all the shareholders – ensure that the private prison firms are managing the business risk factors that they must disclose in filings with the Securities and Exchange Commission. Risk factors include not getting enough inmates from government to be profitable, sentencing reform (like the repeal of certain mandatory minimum sentences), steps toward the legalization of drugs, and immigration reform. Selman and Leighton (2010) argue that privatization was born from two trends. First, the relentless war on crime and war on drugs caused massive prison overcrowding. Extremely costly prison expansion and renovation were the inevitable results of “getting tough,” but it ran into conflict with politicians’ other favorite lines about lower taxes and less government. Second, President Ronald Reagan declared in his first inaugural address that “government is the problem,” and he set the stage for anti-government politicians to privatize a range of services. The historical moment was ripe for several politically well-connected individuals, backed by the same venture capital that facilitated the expansion of Kentucky Fried Chicken, to use private funds to build their own prison and collect money from government to house inmates from overcrowded facilities. As briefly noted in this chapter [of Class, Race, Gender & Crime, 3rd ed], the incarceration binge has been costly and ineffective – —and has contributed to social injustice (especially racial). Selman and Leighton (2010), after developing these points more fully, argue that private prisons were born from an oppressive war on crime and the future of their business depends on the continuation of those dynamics. Companies traded on the stock exchange owe a basic duty to shareholders to grow and become more profitable, regardless of the impact on others or on justice. Privatization has several important implications for understanding the intersections of class, race, gender, and crime. First, in a variation of The Rich Get Richer and the Poor Get Prison (Reiman and Leighton 2010), with prison privatization the rich whites get richer because the poor minorities go to prison. As noted in chapter 3 [of Class, Race, Gender & Crime, 3rd ed], stock ownership is concentrated in the hand of relatively few wealthy families who are mostly white. As noted in this chapter [of Class, Race, Gender & Crime, 3rd ed], those going to prison are disproportionately minority – and private prisons have a substantial number of contracts to house immigrants (including detained families). Racial fear means business and profits for private prison companies. Second, chapter 2 [of Class, Race, Gender & Crime, 3rd ed] noted that private prison firms pay substantially less than their government counterparts for prison staff, a point that generates opposition to privatization from unions. (Median earnings for all correctional officers and jailers were $35,760, but private prisons paid $25,050.) But private prison firms also pay their executives substantially more than the head of a Department of Corrections who manages substantially more inmates. For example, the cash pay (excluding stock awards and options) of the CEO for the GEO Group was almost $3 million in 2007 for having 54,000 beds under supervision. The Director of Corrections for Michigan was paid just over $200,000 that year for having almost 52,000 inmates under supervision and a parole and probation caseload of another 200,000 people (Selman and Leighton 2010). Paying those at the top substantially more while paying those at the bottom substantially less directly contributes to income and class inequality. This process is exacerbated by additional fees at the top to the Board of Directors, who make $50,000 a year at CCA and $60,000 a year at GEO, plus fees for attending various meetings (including a compensation committee that decides how much the executive gets paid). In comparison, the median household income in 2007 was $50,230, so the pay for the part-time director position of a private prison was more than what half of all U.S. households earned from all their employment responsibilities (Selman and Leighton 2010). Overhead costs for the directors, SEC lawyers, consultants, mergers and acquisitions, “customer acquisition” (advertising and lobbying), shareholder lawsuits, and shareholder relations mean a wide variety of criminal justice workers will have lower wages and less economic security than if they had a government job. 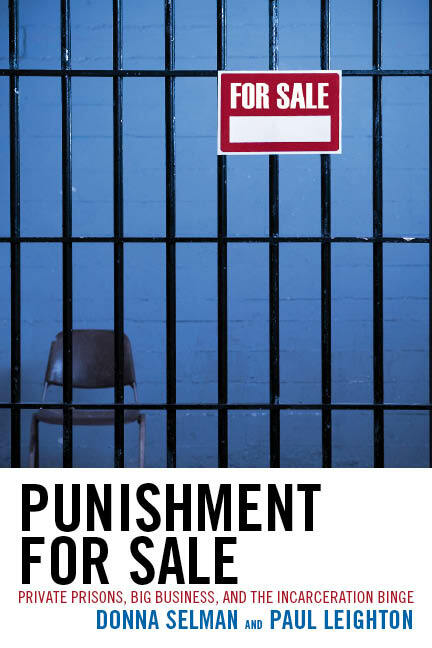 Punishment for Sale is the definitive modern history of private prisons, told through social, economic, and political frames. The authors explore the origin of the ideas of modern privatization, the establishment of private prisons, their business dynamics and the efforts to keep expanding in the face of problems and bad publicity. The book draws on corporate documents, analyzed within the framework the prison-industrial complex, to tell the story of private prisons and their effect on criminal justice; it is intended for supplemental use in undergraduate and graduate courses in criminology, social problems, and public policy. Donna Selman is assistant professor of criminology and criminal justice at Eastern Michigan University. She has contributed to the book Battleground: Criminal Justice. Paul Leighton is a Professor of criminology and criminal justice at Eastern Michigan University. He is a coauthor of Race, Class, Gender, and Crime, and is the founder of StopViolence.com—a resource for non repressive responses to violence prevention. More information on private prisons (current "crime pays" section of paulsjusticepage.com. This will be updated and moved <eventually> to a section related to Punishment for Sale.